Zhou Xiaochuan’s warning was in sharp contrast to the optimism on display at the 19th Party Congress. 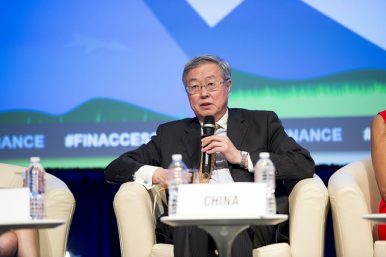 Zhou Xiaochuan, the governor of China’s central bank — the People’s Bank of China (PBOC) — has been unusually outspoken in recent weeks. Amid the 19th National Congress of the Chinese Communist Party (CCP), while most delegates have been busy complimenting China’s great achievements under “the leadership of the Party Central Committee with Comrade Xi Jinping as the core,” Zhou took the advantage of national attention to issue a warning about China’s growing economy. Noting the potential systemic financial risks accompanying China’s current economic boom, Zhou warned the public of the dangers of a “Minsky moment,” when asset values suddenly collapse. The term “Minsky moment” was coined by American economist Paul McCulley in 1998 to describe the 1998 Russian financial crisis, which resulted in the Russian Central Bank devaluing the ruble and defaulting on its debt. There was a severe economic impact on many of Russia’s neighboring countries. Zhou also noted that it is dangerous to be over-optimistic in an economic boom, as too many risks will be accumulated during the economic cycle. This was not the first time that Zhou had voiced a warning recently. On October 15, when attending an event related to the IMF and World Bank annual meetings in Washington DC, Zhou also discussed his concern about China’s growing debt. Weeks earlier, in an exclusive interview with a Chinese financial magazine, Caijing, he openly called for further economic reform and deeper integration with international markets in China. “Reform can’t wait,” he said in the interview. This article has been reposted by many Chinese professionals in the field of finance and economy. Zhou’s recent candid remarks came just before a reshuffle of China’s top leadership, which will be announced during the 19th Party Congress. It is widely believed that Zhou will retire after the Party Congress; at 69, he has already passed China’s regular retirement age.